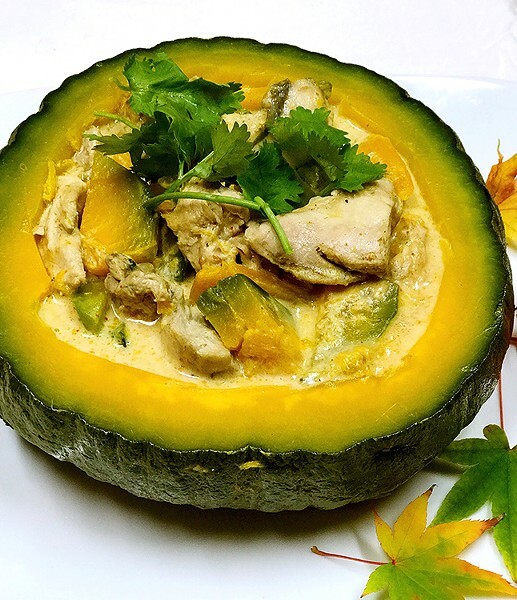 photo by Wendy Chan Fragrant coconut curry in a pumpkin bowl. 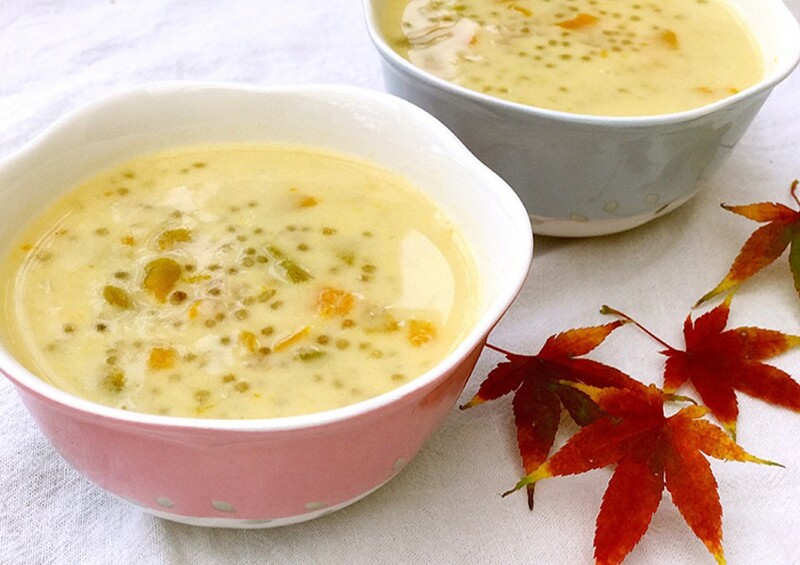 photo by Wendy Chan A sweet, autumnal take on Asian tapioca pudding. Pumpkins are my favorite fall and winter vegetable — though technically a fruit. There are so many dishes you can make with them and you can get few meals out of just one pumpkin. I also love them because they are high in nutrients, antioxidant rich and low calorie. The color of any pumpkin dish brings warmth to a dinner table, too. My boys have always loved curry chicken with green pumpkin. I remember when they were little how they would ask me to make this dish right after their school pumpkin patch trips. It's a perfect one-dish meal for a busy weeknight. Every year, we would pick at least a dozen or more sweet kabochas and Jarrahdales for the winter. The price is reasonable during the fall and visiting a pumpkin patch is a great family trip. Over the last few years, I noticed that the mature pumpkins we picked can last up to six months in a cool place. Pumpkin has been a handy swap, too. We love taro with tapioca pudding but we don't get taro up here in Humboldt very often. So I substitute taro with sweet kabocha and it's equally delicious. In the recipes below, you can make these two favorite dishes from our family with just one pumpkin. This dish uses the pumpkin as an edible serving bowl. For the curry paste, I use Mae Ploy, which is available at local Asian markets. Serves 4. Marinate the chicken in the curry powder and fish sauce for at least 30 minutes. Wash the pumpkin, place it in a steamer basket in a large pot with 2 inches of water of and steam it for 25 minutes. (Alternatively, if you don't have a steamer basket, you can use a heat proof dish resting on a pair of wooden chopsticks or three balls of aluminum foil at the bottom of the pot.) Steaming will make it easier to cut and carve the pumpkin. Once it's cool enough to handle, cut off the top 1/4 of the pumpkin and set it aside. Scoop out the seeds. Then scoop some of the pumpkin meat out (roughly 4 cups) and set it aside, leaving enough so that the pumpkin "bowl" won't break. Warm the oil in a pan and brown the chicken, adding the curry paste and 2 cups of pumpkin. Sauté for 10 minutes, then add the water and 1/4 cup of coconut milk. Simmer for 10 minutes. Place the hollowed-out pumpkin back in the steamer pot. Pour the curry chicken into the pumpkin and steam it again for 40 min. Carefully add the rest of the coconut milk, making sure not to let the pumpkin overflow, and steam for an additional 15 minutes until the pumpkin is soft. Serve with jasmine rice. 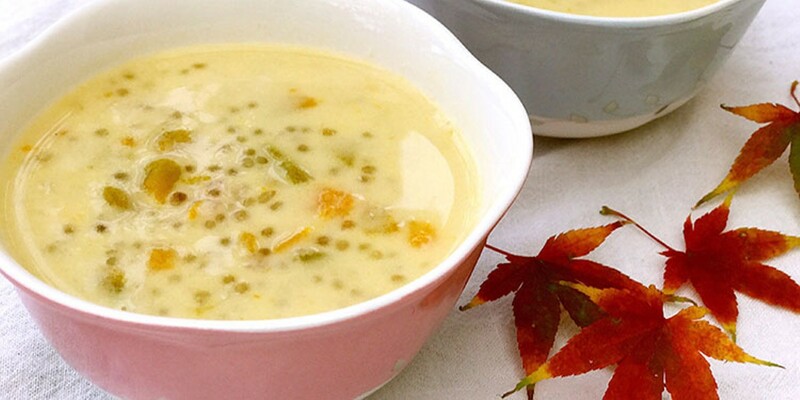 This is a loose, soup-like dessert popular in Asia. Serves 6. In a large pot, bring 4 cups of water to a boil and stir in the tapioca. Keep stirring and let it boil for 5 minutes. Lower the heat and simmer for 10 minutes until the tapioca balls are soft, stirring often. Cover and let the tapioca stand for 10 minutes or more until the centers are translucent. Drain and rinse with cold water. Set the tapioca aside. In another pot, bring 3 cups of water to a boil and add 2 cups of pumpkin and a pinch of salt. Boil for 10 minutes, then lower the heat and simmer for another 10 minutes until the pumpkin is soft. Add the sugar, milk and coconut milk. Let it cook for 5 minutes until it starts bubbling. Add the cooked tapioca, mix well and serve warm in small bowls.